Photos: Courtesy of Joy of Motion; Dance Place; Chevy Chase Ballroom. Odds are, you’ve spent most of the winter in a pair of (very forgiving) leggings, waiting patiently for House of Cards and warm weather. We hear you — the long stretch of frigid temps has put a serious damper on our Saturday nights, too. Thankfully, a period of hibernation always makes us ready for a new challenge, and since 'learn to dance’ has been on our bucket list for a while, there's no better time than the present. And, it turns out, the DMV is filled with opportunities to learn how to tango, waltz, and salsa. Or, you can try your hand — er, feet — at hip-hop, swing, and flamenco. We're willing to bet that a dance class is the perfect activity for a cold winter’s night — plus, you’ll burn some calories and you can show off your moves at those upcoming weddings. Check out this list to find the right class to sharpen your skills, pick up a new style, or just learn how to survive the next time you're dragged onto a dance floor against your will. You’ll be a regular twinkle toes in no time. Glen Echo is somewhat legendary among dance aficionados. The beautiful Spanish Ballroom hosts social dances every Thursday through Sunday, typically with live music. And, for the cost of admission (between $5 and $20), you'll get an introductory lesson to bring you up to speed. Expect styles ranging from contra and waltz to ballroom and Argentine tango. Once your skills are really up to snuff, head to the monthly ballroom-dance event, which involves afternoon tea and a live orchestra. 7300 MacArthur Boulevard; 301-634-2222. See a full list of events here. To learn how to properly waltz, tango, and foxtrot, check out Chevy Chase Ballroom, which offers private or group classes for beginners. Bonus? Your first lesson is free. There’s also an ongoing events calendar with learn-to-dance and show-off-your-skills parties. 5207 Wisconsin Avenue NW; 202-363-8344. See a full list of classes here. Maybe it’s all those years of watching Dancing with the Stars, but we think few styles are more impressive than swing — plus, it’s a great full-body workout. And, D.C. is the perfect place to learn this high-energy style, thanks to traveling dance troupe Gottaswing. The company organizes lessons at gyms, nightclubs, studios, and ballrooms across the DMV. You can take weekly classes, attend one-time events, or register for private lessons. Times and locations vary. See a complete schedule here; 703-359-9882. Confession: We are truly, deeply intimidated by the thought of belly dancing. But, there’s nothing our core needs more than the serious Tracy Anderson-esque moves that come free with this kind of class. Learn the basics at Joy of Motion Dance Center, where you can also take hip-hop, tap, jazz, or flamenco classes. We recommend trying a workshop; our favorite is "Single Ladies," where you’ll learn the choreography of Queen Bey’s hit. 1333 H Street NE; 202-399-6763. See a full list of classes here. Some of us need to learn the most basic steps in a place where we can flail our arms and legs in private, safe from the ogling eyes of strangers. So, naturally, we love that Dance Factory in Arlington offers specials on private lessons and a course on “Survival Dancing." That should get you through your brother’s wedding in one piece. 954 North Monroe Street, Arlington; 703-527-4400. See a full list of classes here. 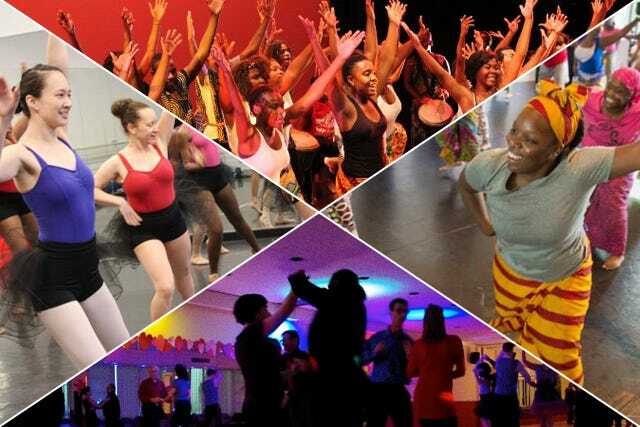 At Dance Place in Brookland, you can take advantage of single classes for quick how-tos in modern, hip-hop, salsa, Cuban, and African dance for $10 to $15 a pop. If you're ready to commit to the dancing lifestyle, buy a 10-class pass for $120 and embrace your inner Shakira. 3225 8th Street NE; 202-269-1600. See a full list of classes here.